Bradford Software Development is a thriving bespoke solution provider based in Yorkshire. The company, and our highly trained, dedicated employees, are proud to have contributed to the success of businesses both large and small in the Bradford area. We have been established for a few years now, and pride ourselves on our ability to include our clients in every step of the development process. We are completely unique in our commitment to deliver, not what we think you need, but what you actually want. Our developers have expertise in a wide range of disciplines from C++ and .net programming to e-commerce and mobile app design, assuring the swift conversion of your fledgling ideas into money making reality. Because of our diversity we can provide solutions able to help bring your whole business into the modern age. From mobile apps and socially integrated websites, to social media campaigns and data driven applications for PC and Mac; we can offer you as few or as many of these services as you wish, and you remain in control. Why might you benefit from our help? If you have a project half finished, or your business has simply outgrown the software you own, we can work with you to upgrade your systems so that they better suit the needs of your company and the needs of your increasingly tech-savvy customers. Our approach is professional, but informal. We employ an iterative development, client testing, client approval technique that allows you to remain in charge of how your project develops. Because our overheads are low we do not charge highly for our services. Our prices are some of the most competitive not only in Yorkshire, but in the whole of the UK. Although our costs are low, the professionalism and work ethic at Bradford Software Development is guaranteed to provide you with a beneficial experience resulting in the solution you always imagined. Please explore this site for more detailed information about our various services, or feel free to give us a call! You can also email us via the contact form or join us on Twitter, Facebook, LinkedIn and Google+. 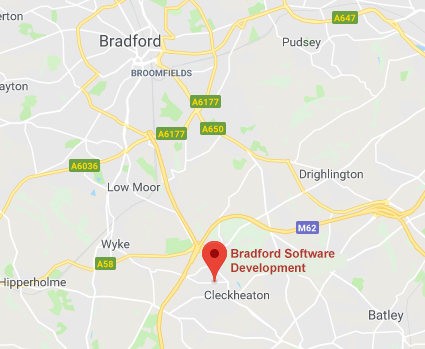 Don’t forget to check out our blog elsewhere on this site for latest news and updates from Bradford Software Development. We look forward to hearing from you soon!